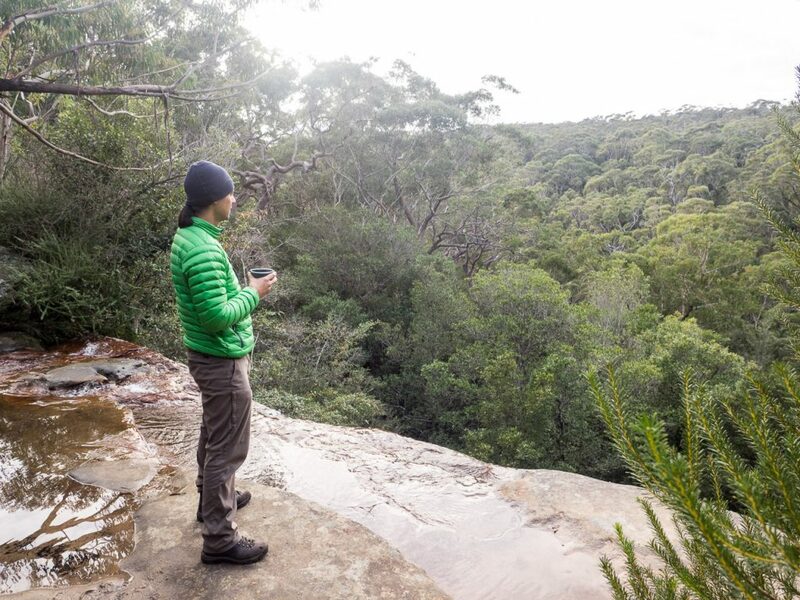 If you’re after an overnight, off-track experience right next to Sydney (and are reasonably fit), then put this walk in the Royal National Park on your list. These are some rough track notes for a 19-20km walk from Waterfall to Engadine. It follows bush track and service trail for most of that length. 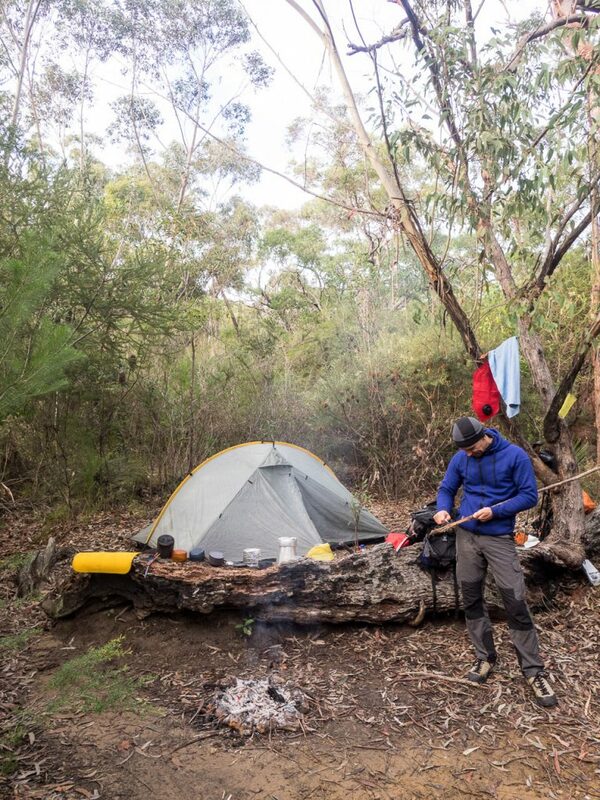 However, there is a significant amount of off-track walking along Kangaroo Creek on Day 1. You should be fit and know how to navigate and self-rescue. I wrote up a more narrative version of this story for We Are Explorers. Catch a train to Waterfall Station. 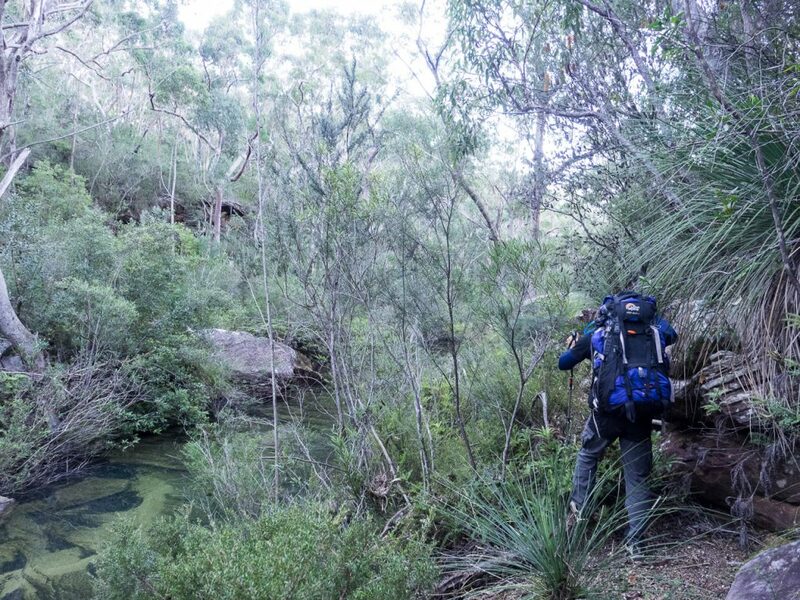 From there it’s a short walk to the Uloola Track, which continues onto Uloola Falls – your destination for the night. However, the more scenic and strenuous option is to take an obvious turnoff to the left a hundred metres or so after the track’s start. If you’re doing a car shuffle, park at Engadine Station and then catch a train to Waterfall. 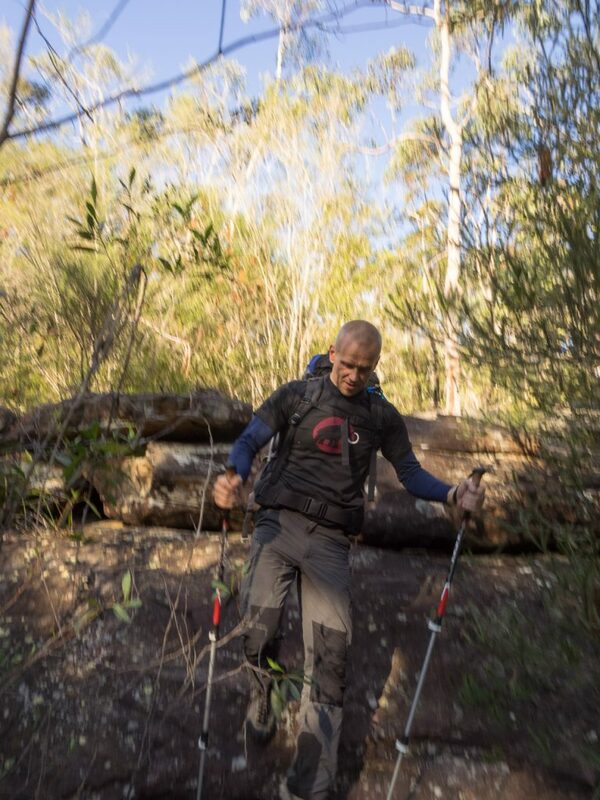 Follow the rough bushtrail, marked with ribbons, down through some tea-tree and banksia scrub. Soon you’ll emerge onto a rock platform above a series of small waterfalls. 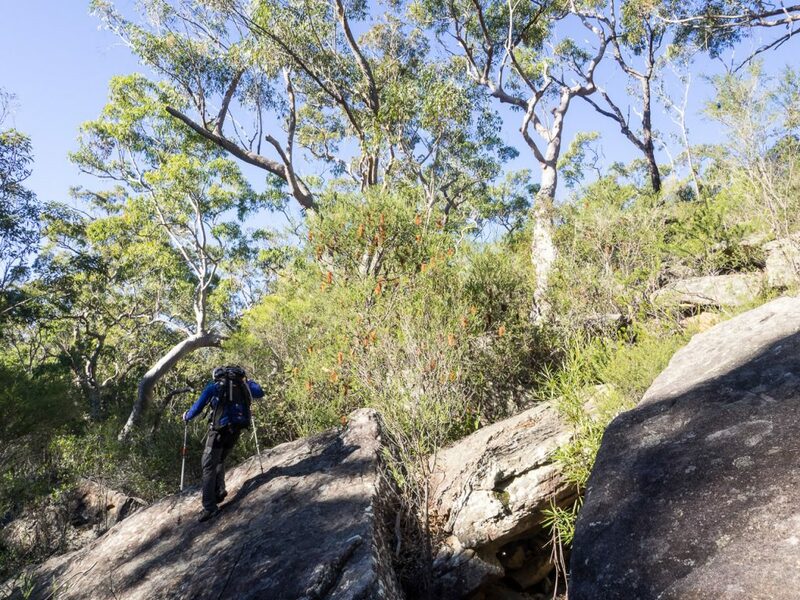 Scramble down the rocks to Kangaroo Creek and then follow another bush trail. You’ll pass small cascades before, eventually, you arrive at a massive pool fed by a 4m-high waterfall. This is where the track moves from being a trail to a “negotiable route”. For the next few kilometres you’ll be alternating between rock platforms, sandy banks, scrub-bashing and the occasional scramble up or down boulders. Parts of this section are just mind-blowingly beautiful. Mostly you’ll stick to the right bank but don’t be afraid to go to the left bank if there’s a clearer route. Just make sure that you are back on the right bank after you walk past a 4-m high cliff on your right, when the creek swings left. When you walk past this small cliff, make sure you’re on the right bank. Goondera Brook is not far off. John and Lyn Daly’s track notes in Take a Walk: Southern NSW & the ACT suggest that there are rock cairns to help guide the way, but we saw only one or two, possibly because of the recent record storms and flood (or possibly because we’re terrible route finders). Either way, allow a couple of hours for this section of the track. 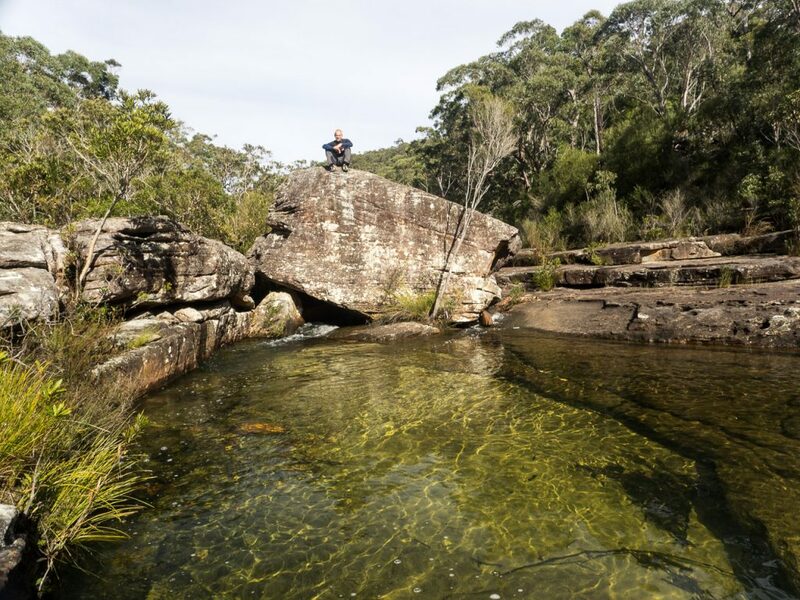 Eventually you’ll reach a vantage point over the pool where Goondera Brook joins Kangaroo Creek. We hit this spot about 4:15pm. 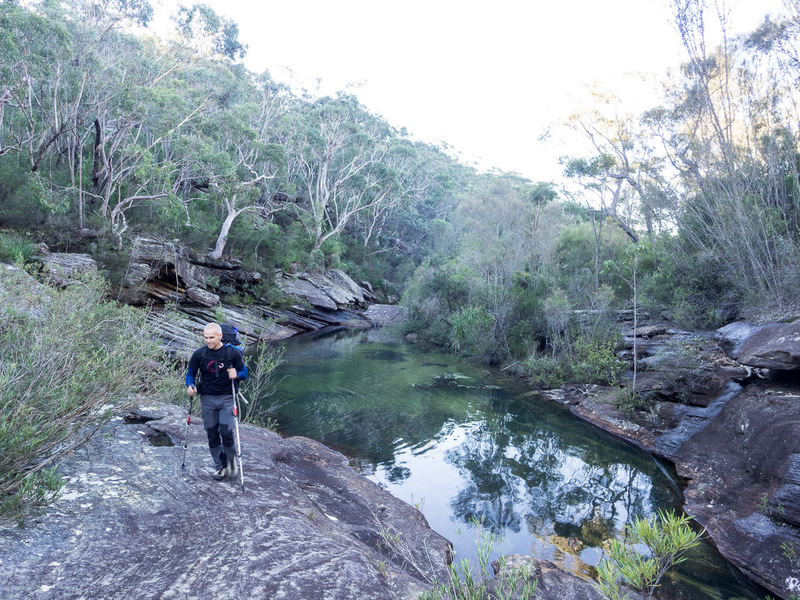 Given that we were doing the walk in late June, we finished the last section to Karloo Pools (one of my favourite spots in RNP) in the dark – it was dicey going along some treacherous terrain. My friend Garry slipped and snapped a brand new trekking pole. 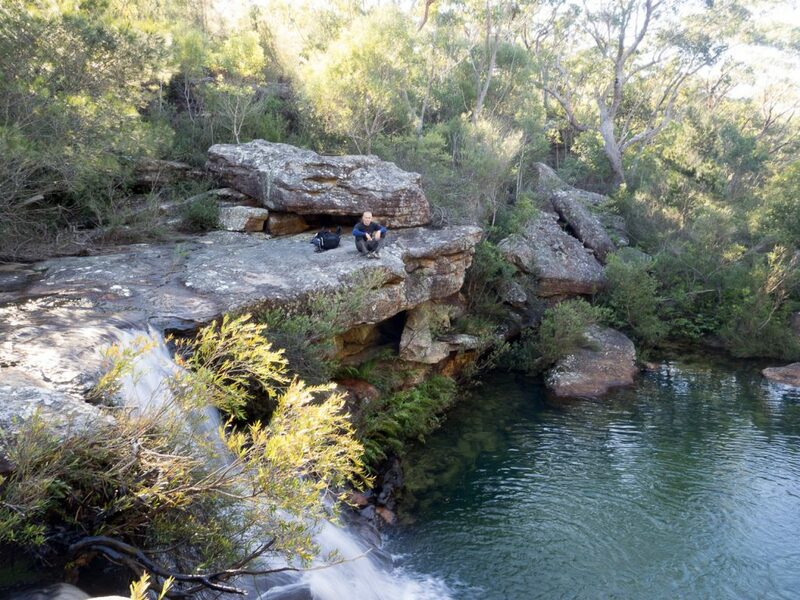 Once you’re at Karloo Pools, it’s an easy but steep walk up a bushtrail to Uloola Ridge. 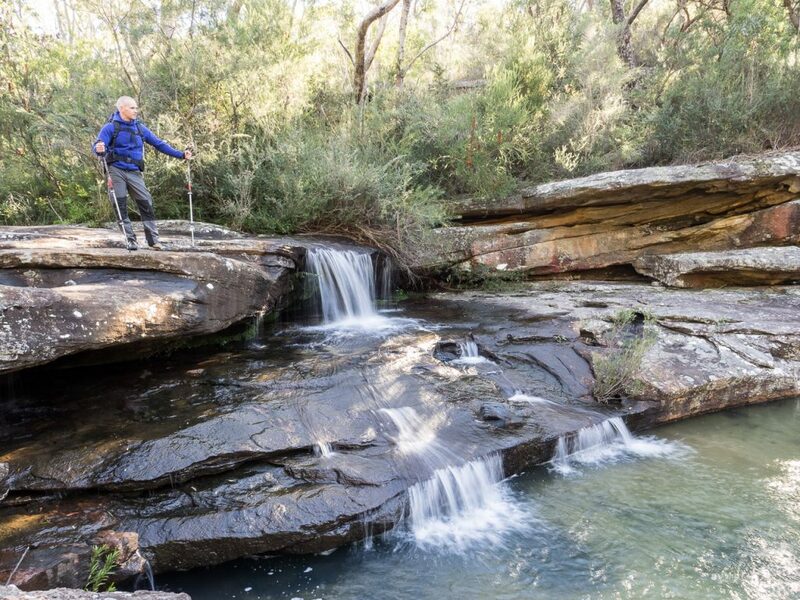 It will take 60-90 minutes to walk the 2km to Uloola Falls where there is a lovely little campground (bookings required). All up we were on the trail for well over 6 hours (I had allowed only 5). Uloola Falls campground: we camped with a Duke of Ed group but were able to find a nice private spot by ourselves. Day 2, by comparison, is a walk in the park, albeit a hilly one. Follow the Uloola Track to Audley across the ridge until it joins up with Robertson’s Roundabout Circuit. Turn left (northward) and then turn left again (west) after 500 metres or so when you reach the Engadine Track. 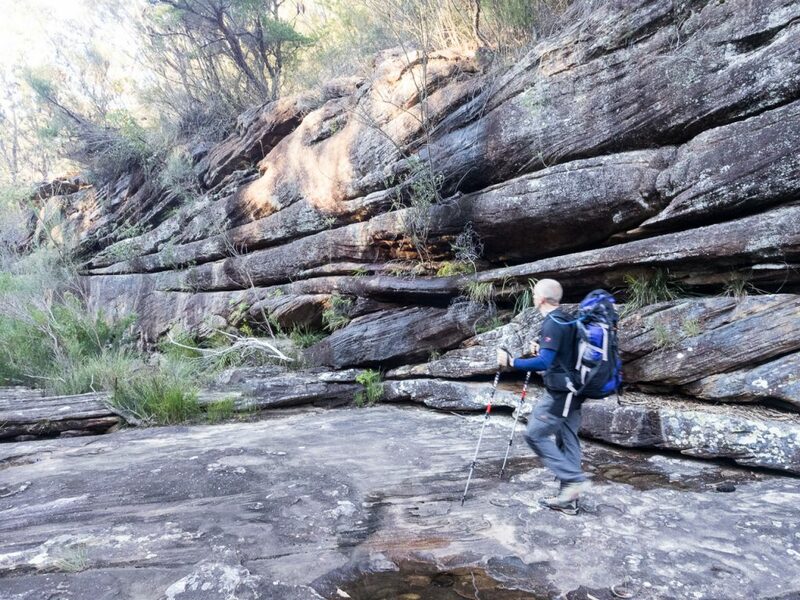 This leads steeply downhill to Kangaroo Creek Pools – another highlight on this walk. After that, you’re only one steep hill and a few kilometres of ridgetop walking away from Engadine Station. Then it’s a train trip to the closest pub/fish n’ chips shop/loved one. You’ll enjoy your final destination so much more for the bush-bashing experience on Day 1. 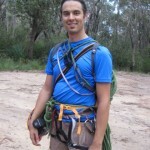 Garry sits atop a massive boulder at Kangaroo Creek Pools: another of the walk’s highlights. If you want to get a real flavour for the walk, check out this video that I shot on a GoPro Session. Forgive the dodgy quality. This was my first effort with the camera and I’m still working out this whole video thing!